A deep corps of running backs should have take some of the pressure off of Iowa senior Mark Weisman this season. Weisman led the Hawks with 975 yards on the ground in 2013 but more than 600 came in the first five games of the season. Weisman says all of the running backs bring something different to the offense. Weisman says they will all benefit from running behind an experienced offensive line. “Its fun to run behind them, absolutely it’s fun to run behind them. 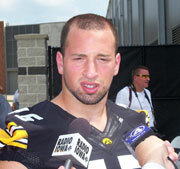 They make the job easy for any of us runningbacks out there,” Weisman says. Iowa is coming off an eight win season and has a lot of experience but Weisman says that does not guarantee success this season. “It’s hard to tell, we have a lot of guys returning, we have a lot of guys who left, that’s how it happens every year. Right now is when we build a team, and I’m excited to see what we can do,” Weisman says. Iowa opens August 30th against UNI.